The American painter and printmaker Arthur B. Davies began his training at the Chicago Academy of Design from 1879 to 1882 and studied briefly at the school of the Art Institute of Chicago before moving to New York City, where he attended the Art Students League and established himself as a magazine illustrator. About 1890 he devoted himself to painting, and by 1892 he was selling his work. He soon signed with the New York dealer William Macbeth and was on his way to becoming one of the most respected and financially successful painters in the United States. He traveled frequently to Europe and worked in a lyrical decorative style that many compared that of the nineteenth-century French muralist and painter Pierre Puvis de Chavannes. Davies’ promotion of European Modernism was his most important contribution to the Armory Show, though it displeased some of his American colleagues who had hoped for more visibility. 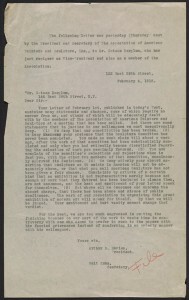 A week-long trip to Paris in November 1912 with Kuhn, guided by American expatriate Pach, solidified his conception of avant-garde art, as he met with and arranged loans from the Duchamp brothers, Constantin Brancusi, Odilon Redon, and Gertrude, Leo, Michael, and Sarah Stein, and several influential dealers. From Paris, Kuhn and Davies travelled to London, where they saw the Second Post-Impressionist Exhibition at the Grafton Galleries and borrowed works by Georges Braque, Pablo Picasso, Henri Matisse, Andre Derain, Maurice Vlaminck, and Pierre Girieud. The art that Davies saw in Europe was a far cry from the European Realists and Impressionists that he originally intended to include in the exhibition, and it changed the course of the Armory Show. “Insurgent Artists Lose a President,” New York Times, January 4, 1913, 1. A secretive man who was hiding a double life, Davies left no papers upon his death in 1928, so impressions of his role in the A.A.P.S. must be gleaned from the accounts of his fellow members. See Kimberly Orcutt, “Arthur B. Davies: Hero or Villain?” in The Armory Show at 100, Modernism and Revolution, Kimberly Orcutt and Marilyn Kushner, eds., exh. cat. (New York: New-York Historical Society, 2013), 29-30. Guy Pène du Bois, Artists Say the Silliest Things (New York: American Artists Group, 1940), 174. European modernism became the focal point of the show. Though the exhibition opened with a gallery of American sculpture, European painting was literally center stage, with American painting sidelined in disconnected galleries. Summoned by Kuhn, Davies arrived in Paris on November 5, 1912. Orcutt, 32. See also Milton Brown, The Story of the Armory Show, 2nd ed. (New York: Abbeville Press, 1988), 68-72.